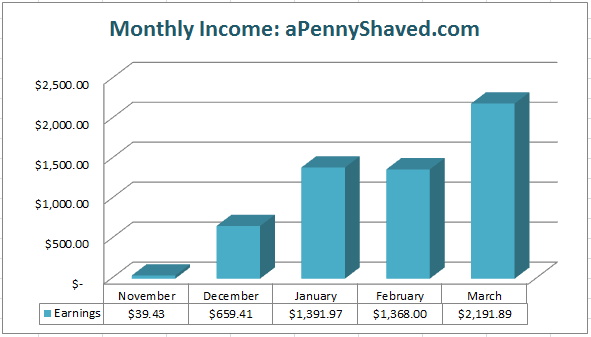 If you have been following the Niche Site Project 2, you know that each month Perrin and I post an income report for aPennyShaved.com. This is the niche site that we developed from scratch, and we've seen some awesome success! So, today, I'm excited to share the income report for March. 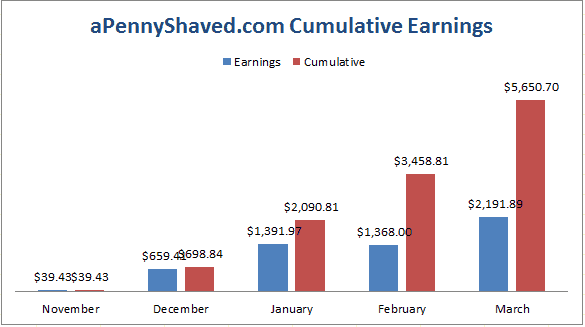 The earnings from March are the biggest yet, and I see no reason for the earnings to stop at this point. Overall, I just want to say that I'm thrilled with the success that this project has had. Perrin is killing it…and I've heard from many of you stating that this project has really helped out your business as well. So, this project has been even more successful than I could have initially imagined. Hey guys! It’s me again. And I’m here with a bitter-sweet income report for aPennyShaved. It’s sweet because (as you’ll see below) the site had an astonishing record month. But it’s bitter because I think this is going to be the last income report I do for a while. We’re going to put a hold on the earnings mostly to reduce the risk of the site in case I want to sell (in the event the earnings hold steady), so this should be a final, awesome picture of the success we’ve had with this site. Overall, the traffic this month has increased quite a bit, even though it may not necessarily look like it from the graphs. But it did! Last month, the site saw about 24,000 unique visitors. This month, the site brought in just over 32,000 unique visitors. That’s an increase in traffic of about 33%. Why did this happen? Long-tails, of course! At least, that’s my guess. When the site really started earning money in December, I had about 20 new articles written for the site. As we’ve seen in most of our sites, it takes any given keyword about three months to rank in Google. Some take longer and some don’t take quite as long, but as a general rule, most keywords rank in about 3 months. Now that my articles have been incubating for about three months, they’re starting to rank for a bunch of different long-tails, which has resulting in about 8,000 new visitors. Pretty cool! The lesson here is pretty simple: if you see your site is earning (i.e. a site that has shown it can bring in a few hundred bucks a month), blast it with great content. aPennyShaved has about 35 total articles. For my next sites, I’m going to step this up even more and shoot for 50 total articles – or even 100 articles in good markets. I think that’s probably a good way to maximize your earnings in a 6-month timeframe. Now for the fun part. You’re probably not going to believe this (because I certainly didn’t). Around the 15th of March I started to realize I had a monster month on my hands. My traffic was picking up, and so were my sales. At the pace I was going, I knew there was a pretty high ceiling on my earnings, and it was super, super fun to check my Amazon account each morning. The site earned a grand total of $2,191.89 in March. That’s nearly $1,000 more than it earned in February! I’m pretty floored by this. It probably won’t sink in until I actually get that $2,000 check in May, but man… it’s just… crazy! Needless to say, I’m super happy, and I hope these trends continue. What work did I do this month? Nothing! Aside from fixing a few technical glitches, I did absolutely nothing to the site in March. So, that big $2,000 payload was 100% passive. Now, THAT’S what we’re all in this for! That big, fat, totally passive paycheck. Yeah, buddy! Keyword research is king; everything else is an experiment. Keyword research is the one thing that will almost never change. On-page, off-page, link-building, etc. Those things are going to change even at the level of the site. You're going to be doing things differently for every single project. Keyword research mostly stays the same, and it is about 80% of the puzzle. Good keyword research will do more to help you rank than anything else. When doing keyword research, competition is a GOOD THING. I used to be scared off by the competition. If I saw another niche site, I'd get freaked out because someone was already doing what I wanted to do. This is 100% backwards. If you see another niche site in the top 10, it only means one thing: Google is happy to rank niche sites for this keyword. Nowadays, it's my #1 criteria. I ONLY go after keywords that already have a niche site in the top spot — because I know I can beat it. There's a tool for everything. I have basically zero technical skills. However, I've always been resourceful. One of the lessons I learned really early on was that there is a tool for everything. There's a tool for making tables. Tools to research your competition. Tools for quickly creating Amazon links. Tools for making squeeze pages. There is literally a tool for everything. BONUS TIP! Buying links is totally fine. SEO is virtually impossible if you're doing it white-hat only. Well, it's not impossible, but it takes a long, long time. And you will likely need about 1,000x more content. So, good purchased links — stuff like Rank Hero — should be embraced. For me, Rank Hero was the difference between making $0/mo and $2,000/mo. I'll take it. BONUS TIP #2! Outsource to people you know. I have a ton of colleagues who outsource via Elance/Freelancer/etc. It's never worked for me. Why? You can't talk to people you don't know! Now that I work for Spencer, I manage half a dozen different writers. Each of them is someone I know. It just works a lot better, especially if you're paying a fair price. So, team, we’re about done with this one. It’ll still keep earning, and I may decide to sell it (heck, you can even email me if you’re interested! ), but for now, this is the end of a very awesome chapter of my career. Building this site was literally the beginning of a new life for me. It’s the tool through which I pried myself out of the toxic, soulless corporate world and started doing something I loved. It also facilitated a working relationship between myself and Spencer that eventually lead to a professional partnership in which he hired me full-time and became a cofounder at Vylo. So, really, I’m just super grateful. I’m grateful to you guys, who’ve been incredibly supportive, engaged and enthusiastic about this weird world of SEO that we all love – I’ve made a lot of great friends here. I’m grateful to my girlfriend, who’s never said anything except “I believe in you!” And I’m grateful to Spencer, who’s invested in me and has become a good friend. So we’re closing this one out, guys, but we’re definitely not done. Not by a long shot… not when there’s sites to build, markets to disrupt, worlds to conquer. So let’s get back at it; eh? Til next time! Wow, over $2k just from Amazon…and 100% passive too. Very inspirational. Have you thought about looking for alternative affiliate programs that will pay you a higher commission % ? You could take your biggest selling product and try that one first and see how it goes. If your conversion is lower and not making as much as on Amazon, then you can always go back to how it was. And nope; I’m just going to let this project ride for now. I’ve already started on my second site, and it’s just starting to make some money. So that’s where my time and money is going at the moment! For you new site- what is the backlinking strategy that you are using for it? 2. 25 average PBN links in the PA30s with partial- or no-match anchor text (I’m currently in a professional group that pools its PBN sites together). This one was a bit tougher, but I’m currently number #2-3 for one of my primary keywords, which gets 8,000 searches/mo. Thank you so much for your replay ! Can I ask you about anchor text ? When you say 50 blog comments do you mean 1 comment on 50 different relevant blogs? Or do you suggest like 5 comments on 10 relevant blogs? Also, how do you vary the anchor text of blog comments when they usually hyperlink your name? Because he said “these give the site relevance, anchor diversity and IP diversity” for the blog comments, I’m pretty sure it’s 1 comment per relevant blog/site. For anchor text, you give them your name, but it doesn’t actually have to be Firstname Lastname, it can be your keyword or some related keyword. Of course it’s then up to the webmaster if it will be allowed. Looks like a solid strategy Perrin. Can you share some names of those services? I’m going to be doing some link building for my second niche site soon, so it would be great to have a few options. BTW, do you do your own blog commenting or do you out source it? If so, how and to who? Perrin I stumbled upon your new site today. Well I wont disclose it here to safeguard your interest. Doesn’t sound like his new site; probably someone elses. Congratulations guys! You deserve it! Keep up the good work. Looking forward to more case studies in the future. Unbelievable! You killed it! I’m going to start your case study over and follow it word for word! Congrats on the earnings man. Its really inspiring. It is little bit hard to note down steps you followed from first day of development of this website. As a regular reader can I expect pdf worksheet of module/sections to develope niche website from keyword research to the appearence of website in google’s first page? Who knows! Possibly. There’s quite a bit to cover, and we have a lot of projects going right now, but it could be fun to do in the form of a neatly packaged class. Hey Raj – I can help. I’ll avoid a shameless plug directly linking to my site. However, I can point you to Niche Pursuits Podcast Episode 26. Spencer – Congratulations to you and your wife on the birth of your child! Great news. Perrin – Way to kill it, what an awesome month. Really excited to see where your journey takes you, you’ve got some skills, man! Congrats on the new addition to your family Spencer and awesome results Perrin! That is great to see the large jump with very minimal efforts over the past month. To infinity and beyond! I’ve been following your progress since the start. Congratulations on a job well done and good luck in your new endeavor! Fantastic job Perrin, It was a joy to watch. You touched on a few things that I have come to realize as well. Get the keywords right and know that you are going to be using expired domains….. Everyone else is anyway. My next site will be a case study from the ground up in a similar way. I just did a training that showed me finding the keyword so I think we will be ready to go with that. I do have one question though, you never got in the sandbox with this site, any idea why? I have a site created in december that is stuck and I am chalking it up to mediocre content and too much of an aggressive linking strategy too soon. I will focus on building up quality content slowly with my newest site. Great job and hopefully the site keeps up the earning trend! And I think it was in the sandbox in October/Nov. It was 500+ for over a month, even with the first few links. I had the same experience with my second site: shot to p.3 then, dipped to 500+ for about 40 days, and then finally jumped to p.1. Just gotta plan for it. SEO takes time, and most keywords are going to take about 3 months to rank IF you have the time and resources to do it all correctly and efficiently. Hi, It’s same for me, some pages of my blog are in the sandbox while February, I just want ask what can I do now ! should I stop making content, backlinking ?! Sad to hear this is the last update but well done Perrin and congrats on the family news Spencer. Glad to hear you say it takes around 3 months for ranking to really kick in as i am about 6 weeks in and starting to get a little paranoid that i’m doing something wrong. Good luck with the site in the future. Congrats perrin – great series and I want to let you know that you (and spencer) finally gave me the kick in the pants that I needed to give this niche site thing a serious try. I’m not ranking on the first page yet for my main keyword, but I am starting to sneak in there for some secondary keywords and my main keyword is on pg 3. Great month, and I hope that soon I can turn a profit on my site and continue building them and building a passive income stream. Spencer – Congrats on the baby, and I’m glad to hear everyone is doing well. Also perrin, I was hoping to get a comment from you about the best ways to make money online in 2014…can I email you or would something else work better? Thanks so much perrin – you’ve been a great inspiration and because of you and spencer I built a niche site and am almost on the first page! I’ll shoot you an email tomorrow. Spencer – Congratulations on the new addition to the family! Perrin – Awesome work, man. This just more evidence that niche sites are still working out just fine. I can’t believe your traffic numbers. That’s really amazing. Congrats! “Blast it with great content” love that. I think this is actually where a lot of us go wrong. We build out a site and then leave it to start something new… a carry-over from the “churn and burn” days. In reality, if a site is already ranking, the best thing we should do is capitalize on those rankings by pushing more similar content out. Google already trusts apennyshaved, capitalize on that trust, you know. Selling would be a great idea. I’d like to hit $1mil in the bank and it’s been occurring to me that building to sell is a great way to do that. I’ve been speaking with a representative from a major site brokerage about selling one of my sites. She recommended letting it hit the 1 year mark in order to get the best price out of it. Let me know if you want me to put you in touch. I’ll be the first to admit to starting a site and then abandoning it. Usually I start having second thoughts about my targeted keywords and how it’s not going to be as easy to rank as I thought. I have those same thoughts. I think everyone does! Spencer has definitely had to remind me more than once that SEO takes TIME! I can ease you mind a bit more than just “it takes time” here. I’ve done a poor job with keyword research for my first site. It’s primary keyword is actually KC42 and I haven’t yet made any articles that actually target any other keywords, just had written about 20 product reviews. Yet the site has made about $700 in March. I built the site in May, but it actually first started earning in December, because of one thing – link building. I did some manual link building before that, but wasn’t ranking anywhere. Then I bit the bullet, bought a $200/month subscription and nothing terrible happens, the site will be turning a profit this month. Keyword research is very important, but with good link building (essentially spending a bit more) Google will forgive you for some mistakes. Of course, non of this matters if the search volume isn’t there. And yea… building to sell is interesting. It’s certainly more viable now than it has been in the past, since there are more brokers around than just Flippa. However, you REALLY need to be confident in your process, I think, since every time you let go of an asset, you gain a bulk lump sum and lose monthly revenue — which means you need to have a fairly high rate of success for it to work. P.S. Thanks (again) for meeting up and buying me a beer! This post reaffirms to me my drive to focus on niche site development for all the reasons you stated in the article. I too do not have a technical background, so I have partnered with a tech partner that will accelerate my growth. Each day my mail box gets bombarded with “shiny objects”, I just keep pivoting back to your process that I TRUST! Thank you guys for keeping me focused and driven. Ha! We’ve talked about this, actually. We have a LOT going on here right now with our now niche sites, Vylo, LTP, etc. — so it may be a bit later if we end up doing it. Spencer, congrats on the new baby! And Perrin, congrats on your record month! How much traffic do you think you’re getting from readers of nichepursuits.com? I’d love to see a new case study where you don’t share the targeted keywords or URL and see if you can still get similar results. Keep up the good work! I look forward to following along on your future endeavors! I only get about 500-700 visits from NP when an income report comes out. The rest is natural. It’s a pretty small percentage of my traffic, and those folks usually don’t click the affiliate links. Good to know .. thanks for the reply! also I am interested in selling my site anybody interested please contact me thought my site or perin and Spencer any ideas for selling a site? Why is every niche site creator so quick to sell a successful site before it has even reached its prime, I get the impression as soon as it gets sold it will tank as did Tung Tran’s site, seems like you try and make a quick buck and sell it asap. What do you think, is this the case or am I thinking wrong. I’d be happy either way, really. This site will keep earning for sure. I’d just like the capital to pay off one of my student loans and to invest in my business. I’m not actively trying to sell it right now though. I mean, it’s making $2k/mo. I’m certainly satisfied with that. Way to go Perrin! Impressive stuff for sure. Are you doing long-tail keyword research for every blog post? And how exactly are you using RankHero- for the blog posts or for your main keywords? Yep; I research all my longtail keywords in advance, and then I just write a post for every one (or pay someone else to write it). I only used RH to link to my two primary keywords. Congrats on the big month. This is so exciting and inspirational; I can’t thank you guys enough. On a previous post about linkbuilding, Spencer advised against purchasing links for a site that you plan to keep for 6 months or more. This was mainly because of the risk that google may potentially slap the site due to the purchased links. Was wondering how you and Spencer feel about this now. You seem to be very sold on the linkbuilding strategy that you used, for good reason. I’m at that point on my site now and trying to decide how closely to follow your blueprint. Link building always changes, and every site is an experiment. So I’m certainly not sold on this strategy, and with my current sites, I’m experimenting with many new link-building tactics. However, I Spencer has almost always outsourced his links if I’m not mistaken. Google doesn’t slap you for purchasing links; most of the time, espeically with stuff like manual blog comments and high-quality PBNs, there’s no way for them to tell what you paid for and what you didn’t. What I meant about buying links for sites you plan to keep long term, was more about sites that you are truly trying to build a brand and keep forever. If one site is your bread and butter, I wouldn’t risk buying links (for example, I’d never buy links for NichePursuits.com or LongTailPro.com). But if you have several niche sites; buying links is fine – because these are riskier investments that you should expect some to earn and some not to earn as much. Hope that helps. Well done Perrin and Spencer! Who could expect that your shaving niche site will be making more than $2000 per month? Your example can bring the inspiration to everyone who want to try himself in niche sites building. Good luck in your next projects! Great info Perrin. I have been following your great progress and have been building my own set of niche sites in parallel with aPennyShaved. I’m pleased to say that I have also done quite well on income thanks to you and Spencers advice. I did however also sign-up to Rank Hero and purchased the initial 5 post (10 links) package to see how things progressed but they did not seem to impact my niche site at all. Can it take a little time or do I need to throw more links at it. The KW I was targeting was in the 2500 hits/month range so didn’t think it overly competitive. That depends on a lot of factors. Site age, on-site optimization, and anchor text are just a few. Building a niche site is a constant problem-solving process. So it could be that you need more links, or it could be something else. You just have to dig! It also really depends on the keyword itself. Just because it has 2500 monthly visitors doesn’t mean that it’s going to be a keyword that is easily ranked for. You have to factor in some things such as the type of keyword. Is it a keyword that Google is going to favor Ecommerce sites over Niche Sites, etc. Congrats man! This case study is the single most valuable free resource I’ve found on building niche sites. Thanks for all of the hard work and the updates. You deserve massive success! What content/structure strategy are you taking with your new site? Similar to APS? More authoritative? Ate you focusing on ranking for that main keyword (8k searches) first or a smaller one like best safety razor? Thanks again! Now back to my own keyword research. As for content, the strategy is very similar. I’m shooting for two primary keywords, and I’m currently #2 for one of the big ones. Great job man! Hope you do better with this one. Also, Spencer, you are a great supporter, I must say. Perrin, did you use a brand new or an expired domain for this project? I am currently building my own PBN, so I cannot concentrate more on my actual sites because I regged a few expired domains and they work like a charm, keep regging every day. But dealing with content is so time consuming. You said you are pooling your PBN’s. can I join you guys? I have really good expired domains. I will also shoot an email to Hayden since they are also internshipping for PBN building. I would like to grow my PBN pool really. Congratulations Spencer and Perrin. you guys are a big inspiration. Because of you guys I changed the whole of my IM strategy. I’m building authority sites with the niche ideas I’ve learnt from you guys. Wishing you plenty of success going forward. I feel like to run as soon as possible while reading your report. It was amazing. However, all cannot be resolved alone. Needed a nice outsourcing and tools that work well. I will continue reading your monthly review. Fantastic Case Study and i was eagerly waiting for this income report. So i think i need to start building some niche sites ASAP. Thanks for motivation and inspiration. Will follow step by step your case study to build my 1st niche site. Next, Perrin – I enjoy reading your monthly roundups always and this one was no different. Thrilled and excited at the same time to see it progress even further. NSP 2 was definitely a huge success and it proves building passive income online is definitely possible – you just need the two P’s – Patience and Passion. First of all a huge congrats to your Perrin. This is really inspiring stuff! Spencer – a while ago I think someone asked about testimonials or success stories for Rank Hero. Do you have any ready to share (besides Perrin’s obviously very successful example!)? It’d really help undecided people like me. Ben, thanks for the reminder…I’ll combine some in a more formal manner. (But yes, have heard from several people seeing great results). Thanks! That is awesome Perrin, congratulations on such an amazing and continued success! It’s really inspiring! I recently decided to go after a keyword that already had two niche sites in the top 10. Nice to have the reaffirmation that it’s not a waste to go into a niche that already looks saturated. As a side note, as I’m doing keyword research it’s crazy to see how many sites there are now using the Niche Site Project format – they’re everywhere! And they all look exactly the same. Might be time to think about how to differentiate myself from the crowd! Awesome tips and final advice in the last ever post in this series. Thanks guys! I would like to reaffirm the “blast it with great content” strategy. I had a small Adsense site that was getting awesome CTR’s and starting to make a little bit of money. So I blasted it with great content and my earnings have exploded. On track to break a grand this month! The niche has specific differences for each of the 50 States in the US, so I’m currently having my writer create a separate article for all 50 States. Can’t wait to see what happens to traffic and earnings when it’s all done. I might have a monster of a site that I created. As always, thanks for the inspiration guys. Couldn’t have gotten to where I am today without Niche Pursuits. And this particular case study was especially helpful. Thanks fantastic to hear Matthew! I love hearing these stories…best of luck growing your site portfolio. I am just curious….are you finding that the people who are buying through your Amazon affiliate link are actually buying razor related items for the larger majority of the items sold? Or is it a pretty good mixture of all sorts of random items that they are buying? I’m sorry that this is going to be the last income report for APS but wow, what a success story! Congrats Perrin on creating a great niche site and congrats to Spencer too for the new addition to your family. My email admin(Spencer) can see…If you serious about selling it email me a BIN price. What would make for better case study is if you report back in 4-6 months, why ? I am curious to see it is it just a short term thing I say this because the methods you used well I would recommend but alway curious to see how they work. for me I’m still working on my articles. that is the hardest part. are you not concerned that your niche site gets reported and kicked out of Google by publishing all this, especially that you say you buy links and use link networks like rankhero. Curious what are the average KC numbers for your new site? I would guess it would be fairly upper 30s if it has like 8k searches. Also, just curious if your second site is in a niche that you are interested in or not. Seemed like having your content come from you and your brother who were into must have helped create value for the visitors. PS Please start a blog! The keyword I’m ranking #2 for that gets 8,000 searches a month has a KC of 23. Keyword research is — and always will be — the cornerstone of SEO. Finding good ones is important, and my second site is no exception. That said, you don’t need massive volume to be successful. I know plenty of people who have lots (and LOTS) of success with lower-volume keywords. It just has to be the right market. And nope; the new site is not in a market I’m interested in. Trying something new! I chose this market because the broad category is a market in which people spend a lot of money. thanks for this article.. very inspiring. 1) Do you accept KWs with a KC of more than 30? 2) Also, I’ve been trying but it’s like kind of tricky to find a KW with more than 5000 searches but with KC of less than 30? How did you find one with KC of 23 and 8000 searches?? I’ve been trying but does not seem very successful. Spencer – Big congrats on the addition to the family! Perrin – Incredible results! Well done on a life trajectory changing project! How in the hell is your bounce rate so low with a pricing table (which you want visitors to click) on the homepage? Your writing skills are far better than mine, but I bet Google’s bounce rate isn’t even that low. Nonetheless, awesome job on NSP2! You’re an inspiration to many. Gonna miss updates on A Penny Shaved Perrin. Congrats. This has been such an awesome learning experience. Am halfway through content writing for my first niche site. Just nervous I hope I have picked the right keywords. Tried to follow all the principles learnt here, really hope I interpretated everything correctly!! For the sake of learning I just wanted to share my findings with you two. Niche websites in less than a year, 0.6 & 0.7 , are Top #2 and Top #1 in Google, managing to rank out all the Competitors in the Top 10 which most of them happen to be E commerce sites. It seems that there is a lot more to this than Long Tail Pro numbers and can’t take numbers and rules of thumb as law for niche sites. So in short for beginners is hard to make decisions into selecting a Niche. I’m not sure how your example shows that you can’t analyze the competition for niches. If anything, your example probably shows the importance of analyzing the competition, because you can find opportunities where you may not have thought otherwise. I completely agree with you, that’s why I bought Long Tail Pro and I am pro analysis as well. For beginners it’s always a big step to make a decision specially when we are not living in the US. Maybe this finding shows that competing with e Commerce sites is still possible in the Spanish Market, which is much less competitive than the US. And as you mention, sometimes depending of the Niche and Location there are more opportunities than we think. Keep up with more great real case studies! Congrats to both of you two! Spencer you’ll have enough for a hockey team pretty soon. Has definitely been an inspiration to watch this site grow. Very impressive with the earnings for the site. Looks like you’re really ranking for a lot of keywords with this site. This awesome. you ve showwn us that is possible to build a site from scratch and make it a winner. Keep it up Perrin. Hi, Spencer Congratulation on the new addition to your family. I hope your wife and baby are well. Congratulations Perrin for making $2000+ in a month which is huge. March was also a good month for me I have earned over $1100+ from my 2 niche sites and also some other niche sites are moving well. Perrin, good job mate, all that writing paid off big time. In your opinion what made your site a success? I dont mean SEO wise, more of how you actually wrote/structured the site. Like did you have a certain protocol for finding topics to write about or a certain angle to make your reviews better? I’m betting shaving has huge buyer intent because its somewhat of a neccessity and cheap, so theres not a lot of resistance, but clearly you put a little flair in there to make it work so well. Congratulations on making it a big succes! Congratulations to spencer and you! Invested in getting APS too were it is now? That’s a good passive income bro. Myself started a niche site with a super low SEO competition, But there is no scope to write more than 3 articles on that KW. What do you want me to do about that. I Hope you can give some solution to my problem. Thanks. I think it’s a great thing Perrin to get income from a site like yours. Following what you’ve done has certainly helped me on my World Hottest Hot Sauce site. I’d be interested in whether you retain the siote or sell it. Spencer, congrats on your new born. They grow fast and keep us motivated. Perrin, thanks for all the inspiration and sharing the process with us. I’m very happy for your success. Great job Spencer and Perrin! 2k passive! Very impressive and inspirational. Wanted to ask you Perrin in a comment above, about what you meant by “5-10 very strong PBN”? I know it’s above PA30 since that was the previous bullet point. Great stuff Perrin and congratulations! That’s an impressive result for a site that hasn’t been around for awhile — and it’ll only go up =). I agree that it’s OK to buy links to speed things up a bit (as long as it’s coming from a credible service). I have to look into Rank Hero for my own site, but there’s nothing wrong applying this route as well. Outsourcing work is very helpful and sometimes necessary (I outsource a lot), if you want to expand. Other than that congrats again man! Awesome job. I’m having good success with my site as well. It brought in about $700 last month, but I still have to write up my income report. I didn’t do too good of a keyword research back in May, for it, so its KC is actually 42. Yikes! But I bit the bullet in October, signed up for an OK link building service, and saw my first earning in December. It shows that keyword research is important, but it’ll cost you more to rank it. Anyway, I’m busy building my new niche site, which is actually targeting 5 primary keywords. It’s been going kind of slow, because after I get from work I’m mentally pretty much drained. Could you share any productivity tips or tricks for me? Oh, and BTW, your site still has double Google Analytics on it. I think it’s really affecting your bounce rate percentage. My first site has about 65% bounce rate and 1:40 avg. visit duration. It is in a tech niche, so people are more savy internet researches, but still a 3.88% bounce rate cannot be real. P.S. how many other niche sites have you now built for yourself? I want to ask you (or anyone that want to share its thought) about the keyword research. Lets say I find a good keyword, but based my analysis the keyword will probably rank in one of positions 5-10. Will you go for it (and hope to get more traffic from long tail keywords) or leave it, because its traffic potential (pos 5-10) ? Is it depends on the exact match monthly search number? If yes, what is the threshold for going on keywords that probably will rank in positions 5-10? 5000 monthly search? 8000? guys, please answer this question. I too have same question. I have a keyword that’s 22,200 searches/month (9,900 US only), but it’s a KC42, so I’m ranking 6-10. Yet I’m still getting 500+ visits a day and in March I earned around $700. I do have a $200/month link building subscription, but the site is still making a profit, so I don’t mind it for now, but will replace it in the future when it’s not my only site and I’m not as scared to change things. You could, however do what Perrin did and have multiple keywords you target to bring in the visitors. A new site I’m working on, actually has 5 main keywords I target, but I’ll add many more secondary as I build it out. Right now, I prefer to target keywords I think I can rank in the top 3 for. Well done Perrin! 😀 You’ve been such an inspiration! If my site does even 1/8th of what yours has done, I’d be really excited! haha. So, Spencer… are we on to NSP 3?? haha maybe I’m asking for too much 🙁 Great work to both of you! I really appreciate the fact that Perin earned $2000 in affiliate sales for Amazon. This really shows ecommerce shopping websites have lot of potential to generate 4 figure passive income. I would even study various income report for you niche site and try to improve my affiliate sales too. Very cool article. I’m very much glad I landed here. WOW amazing, this is very inspiring. Shows that your hard work at the beginning of adding the articles paid off at the end. Thanks I love reading these updates. Awesome earnings, Perrin! What you and Spencer have done here is such a tremendous help to so many. God bless you guys! You mentioned something to the effect of using different IP addresses when you do your backlinking. Can you go more into this–do you mean you are using different computers? Or do you mean that, everytime you make a new comment on a blog, that you are creating a different IP address? And second, in a previous comment, you laid out your backlinking strategy for brand new sites. You mentioned things like blog comments, HOTH, etc. But can you also say about how long you wait for the site to be live in Google before you do all that? And do you wait to have a certain amount of content, too? Different IPs basically means different websites hosted by different people. So, I mean that you want links on many different sites — as opposed to lots of link on one site. Basically, you want Google to see that your site is connected to a large network of relevant sites. Most of the time, all the links you get will be on different IPs. So, if you have 50 blog comments, they’re most likely going to be on different IPs unless they’re all owned by the same person and on the same hosting account. MASSIVE is an understatement, surely. I’m still floored by this but nonetheless incredibly inspired to reach the same kind of success myself in the coming months. It’s a bit sad that the reports for APS have ended but I couldn’t understand it any better. Heck, I’m not even sure I would have done this report after March’s earnings! Congratulations on your success. If I may how much time should I spend doing keyword research? If you’re new, a few days is a good estimate. More seasoned guys can get some good research done in a few hours. Great job to both of you guys. Looking forward for your next case study Spencer. I would be interested to see the income report for someone doing the exact same things but WITHOUT the pre built in traffic from this blog. I suspect all the fine readers of this blog went to Perrin’s site at least once. Pretty sure that did not hurt anything right? Great project. Looking forward to your next project. I want to say thanks, I was reading every post of your process and it is very inspiring. And thank you Spencer for the chance to watch the process of a total newbie (no offence, ha?) to 2K/month business owner. Your experience was inspiring and as Steve Jobs would say, “Insanely Great!” To see a website go from non-existent to extremely profitable within a couple months only proves that it can be done. Spencer you truly are a wizard when it comes to niche sites. I have a question and I was hoping someone could help me with it. I’ll try to be brief. I have three different websites that I created, 2 are authority and one is a basic 5 page niche site. When I first started, I heard Spencer discussing the importance of interlinking your content within that website. So, I went through and I added links to pages within my sites. Now, when I run my domains through SEO MOZ via Long Tail Pro the only one that shows a rank higher than one is the 5 page site, which now has a rank of 8. But, none of my keywords really seem to be ranking. Yet, on my sport site I have multiple long tail keywords ranking on the second page despite having a domain rank of 1. The sport related site also pulls the most traffic and has even had a couple affiliate sales. I would imagine that if the domain rank of the sport site increases so should the rank of my keywords. Is there something special that you have to do to get credit for links? Recently, I went though and clicked all the links and used google webmaster to make sure all the pages were indexed and had it crawl a couple of the well linked pages. That was only a few days ago so I’m not sure what affect that may have. I am completely perplexed and have looked into back linking on the warrior forum but haven’t seen a solid answer. Thanks in advance for your help with my conundrum! You don’t need to do anything to get credit for your links; as long as your site is indexed and crawled by Google, they know they are there. Moz does not have an index as large as Google, so even though Google sees your links and gives you credit, Moz may not. inspirational to see you income and traffic rise so quickly. $2000k passive for a month is just absolutley brilliant.. i wish for it to continue to grow. What I find so interesting and pretty cool about this whole case study is that you haven’t used social media to build A Penny Shaved. It would be crazy to see how much more successful the site would be with a Facebook and Twitter Page. Because the name is definitely brandable, and there’s a good audience. If you guys do decide to continue this case study, I think something with social media would be great. Now that you’ve got A Penny Shaved filled out with almost 40 pages of great content, how much are the extra pages adding to your 2k/mo. income? Do all of the extra pages get click throughs and purchases? Or, is the majority of your click throughs from the main page or a just one or two pages? I don’t necessarily want exact numbers (although, that would be a great addition/conclusion article for the niche site 2 study). But, I know you’re on to bigger/better. So, anything you can add would be appreciated. Good luck on the gaming app. I think my son will be interested once it’s up and going. Congrats on all the great success Perrin! It’s been awesome to follow along with this project. I know you’ll kill it with future sites. I also cannot thank you and Spencer enough for sharing all of this amazing info. Mahalo mahalo mahalo! I started my first niche site in February. Finally saw it jump from 500+ to 260 today! Made my eyes light up. I know it’s not on the first page but at least I know I’m doing something right. Ha. For all the new readers out there… my advice would be to read all the updates thoroughly (even the comments), watch all the videos (I probably watched them more than once), and take notes. Everything you need to know is in there. And Spencer, congrats again on the new addition to the family! Hi Spencer, I’ve been following your site for a while whilst testing the waters with my own two sites, and a coming app. A bit off topic, but I have managed to rank no. 1 for an image on google for some unintended, but related, key words. Is there a good strategy to capitalise on this? Hey Perrin. Nice to see your site progress. However I have a question. When creating multiple niche sites, do I need to use proxies for each site? And do you use 1 gmail account for multiple niche sites to access to webmasters tools and analytics or do you use 1 gmail account per niche site? No need to use proxies (I never have). I only have my larger sites on webmaster tools, but yes under one account. Also, analytics mostly under one login; but you can use Piwik stats if you are concerned. So do you guys actually buy and use those products you’ve posted reviews for, or did you just go out and comb the reviews of others and synthesize them into your content? I’m referring to the product reviews on A Penny Shaved, btw. So, how much was the income in April? I’m just wondering how Perrin could have so many Amazon affiliate links in his comparison table on his homepage for APennyShaved without incurring any penalties? I seem to recall that Spencer’s knife guide website was penalized for having too many affiliate links in his knife comparison table. Apologies if you’ve answered this elsewhere. I’ve read all of your posts and can’t seem to find an answer to this! I had doubled up on my affiliate links in my original table on my survival knife site. Perrin has it about right. The sites that have published my articles in RankHero are PR 0. How in the world can they justify charging $197 for 5 posts when they are being put on PR 0 sites. Page authority/domain authority or not, when you are trying to rank in google why should I care about Moz’s metric if it isn’t used by google. Great sucesss P! But I have on question for rank hero. Do you have to keep paying 197 a month to keep seeing the benefits or is it you pay 197 for the basic and your good to do the rest your self? The links are permanent, even if you cancel. I have been following the process of the Niche Site Project 2 right from the start. Gave me a lot of great input for my site. Thanks to you and Spencer! Just had a look at your site and was wondering if there is any special reason why you stopped using the review stars and the “pros and cons” for the reviewed product. The results you’ve seen from this project are incredible, you’ve inspired me to have a go at my second niche website. I was just wondering how many long tail keywords you used in your 30+ articles/blog posts. Surely you didn’t target a different keyword for each one.. This has been a really interesting case study, and I want to thank both of you guys for sharing it. However, I have one concern. I was just looking at your inbound links via Open Site Explorer and I noticed that you have a ton of spammy links pointing in your direction. Some are of good PA but most have absolutely no relation to your site’s content. I also noticed some have random anchor texts like “.com” and “Learn more”. I’m just curious, did you pay for these links via Rank Hero? And why are some of the anchor texts so generic? It seems like the big G could bring the hammer down on your site at any time just by looking at your links. These are probably not links we built. All I can say is that traffic really converts to money. I guess I could live with that great idea.